We present a new complex located in "Ostromila" district in Plovdiv. The neighborhood is calm with many green areas. Restaurants, hypermarkets, schools and kindergartens are located nearby the complex. The complex offers 91 compact apartments with functional interior layout, garages - 21, shops - 4, pharmacy, hairdressing salon, cafe, distributed in 5 residential buildings, each on 4 floors. The complex offers 70 parking spaces, as well. The individual buildings of the complex form an inner courtyard with a park area. Different types of apartments are available with a living room, a kitchenette, a bedroom (1 or 2), a bathroom/ wc, a closet and a veranda/ terrace (depending on the floor). The properties feature mountain and city views and functional layout. Terraces /floor/ - frost-resistant granite tiles. Common parts - luxurious railings on stairways and floors, sound and heat-insulated inter-floor doors, well-lit staircases with granite stairs, luxury foyers and corridors. Maintenance of common areas in the complex. The developer is one of the leading market leaders in civil engineering, becoming increasingly established as a leading developer for industrial buildings. 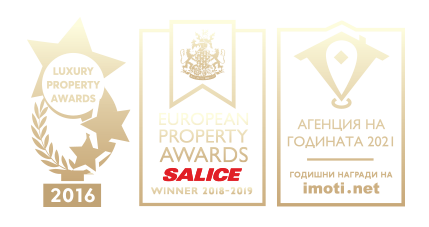 The success of the company is due to loyalty, correctness, adequacy of market requirements and changes in the industry of new-build properties.